WAAPA’s Design courses prepare students for industry employment through practical and theoretical learning experiences, paired with opportunities for practical application of skills and knowledge. Classes and design roles, working with industry directors and choreographers, on WAAPA’s productions, provide sequential skill development in classroom and live production environments, making up an experiential program which is unique to WAAPA, preparing graduates for transition into design related careers within the entertainment industry. The Design program at WAAPA offers a blend of vocational (VET) and degree courses. The initial entry year is for a Diploma of Live Production and Technical Services (CUA50415 Design Specialisation), which is a foundation year of skill development with classes in design studio scenery and costume, technical drafting, CAD, art finishing, drawing, model making, scenic painting, wardrobe technology, props construction and history of theatre. In the first semester, students also work on WAAPA productions as design assistants, applying and developing their design skills in a dynamic, team based, live production environment. The second semester of the Diploma sees students undertaking design roles for productions, with their work being brought to fruition by students from technical production departments for audiences to enjoy, as part of WAAPA’s performance program. On successful completion of the diploma, the course articulates into the Advanced Diploma of Live Production and Management Services (CUA60213 Design Specialisation) as the second year of enrolment. The Advanced Diploma, sees students further developing design related skills and knowledge with classes including design studio, drawing, model making, scenic painting, CAD, design history and contextual studies. Students also undertake larger design roles in WAAPA’s live production environment, experiencing creative and practical team leadership roles in designing scenery, costumes and properties. Graduates of the Advanced Diploma can now articulate into a Bachelor of Performing Arts (Y97 - Production and Design Major). Students who enrol in the Y97 Production and Design degree program can attain the degree over three semesters. 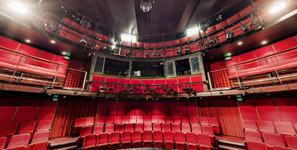 Specialist classes are delivered in the principal studio area to extend design skills and knowledge, in addition to more challenging set and costume design roles in WAAPA’s live production, industry simulated environment for theatre, opera, music theatre, indigenous theatre and dance performance programs. Other classes include but are not limited to: Academic Research and Writing, Arts Management, Industry Studies and Theory and Practice of Contemporary Performance. The degree program is concluded with a 4-week minimum industry secondment, to assist the students’ transition into industry. It is possible for students to apply to enrol directly into the Advanced Diploma or Degree courses. However, applicants must hold an equivalent diploma to the CUA50415 or CUA60213 respectively, in addition to relevant industry experience in design for live performance. Prospective students for WAAPA’s design programs are required to complete and bring a design project, (details available on the ECU/WAAPA website) and a folio of work to the interview. All applicants to Design courses will be given the opportunity to attend a formal interview. With interview outcomes, being communicated to applicants within two weeks of the interview date.